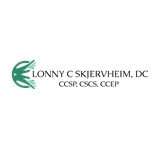 Lonny C. Skjervheim, DC, CCSP, CSCS, CCEP (Bellevue) - Book Appointment Online! Dedicated in supporting as many people as possible in their quest for better health. Our main purpose is to find the cause of symptoms and correct the problem by realigning the spine and other parts of the body which may be causing nerve interference and discomfort. Using the natural healing process of the body to heal the cause of dysfunction and disease without medicine or surgery.